Did people vote for Jeremy Corbyn because they thought he would lose? Joan Ryan, who was Enfield North’s MP between 1997 and 2010 and regained the seat from the Conservatives in 2015, encouraged voters to elect her “whatever your misgivings about the Labour leadership” because she expected Corbyn would not become prime minister. 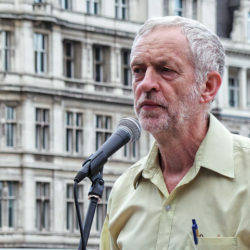 The Corbyn enthusiasm, especially amongst the young, is real, but I would hesitate before saying that all those who voted Labour voted to make him Prime Minister; or that they supported the body of the programme rather than its tone. I think they thought that the likelihood was that the Tories would be the Government, but were determined to neuter the mandate. The idea that every last voter of a party supports its policies is clearly never true, but the question of how much impact people voting a particular way because they thought another option would win still remains. We examine this question using the recently released 2017 British Election Study Internet panel data. In both the wave 11 (April-May) and wave 12 (May-June) surveys, respondents were asked how likely they thought it was that the Conservatives or Labour would win more than half the seats in the election. Looking at these responses over the campaign using the wave 12 data we can see that, although people on average thought that Labour would not win a majority, the perceived likelihood increased markedly over the course of the campaign, in line with Labour’s improvement in the polls. Not all Labour politicians greeted Labour’s improved polling position with glee. As the Labour candidate Joan Ryan put it, ‘There is a very big danger that the polls are scaring off the undecideds and sadly there is evidence that they are – I could kill YouGov’. If Ryan and Blair are correct, we would expect that the more likely people thought Labour was to win a majority, the less likely they would be to vote Labour. Using a statistical model we can examine the relationship between the perceived likelihood of Labour winning a majority and support for the Labour party over the campaign, controlling for other factors that might predict Labour support. So does our analysis support the argument that people voted for Labour because they thought Labour would win? In fact, it suggests the opposite. As the graph below shows, the more likely someone thought Labour was to win a majority, the more likely they were to vote Labour. Because we talk to the same people in multiple waves of the BES Internet panel, we can also look at how changes in the perceived likelihood of Labour winning a majority affects switching vote intention between waves. The graph below shows that when people’s perceptions of Labour’s chances of winning a majority increased, they were more likely to switch to Labour if they were not previously a Labour voter, and were more likely to stay loyal to Labour if they were previously. Although undoubtedly there were some people who voted Labour because they thought they could not win the election, the evidence is very clear that this was not true in general. Indeed the opposite is the case – the more likely people thought Labour’s chances of winning the election were, the more likely they were to vote for them. In a draft working paper we examine this question in more detail and also look at the same question with regards to Brexit (with the same answer). Perhaps it should not be so surprising that in electoral contests with important consequences voters generally make choices that genuinely reflect their preferences amongst the available options.